The SPC61 MIDI Controller is great value for money. Ok, it's not the most authentic feeling keyboard we've ever played, nor is its construction the most solid we've come across, but if you're looking for a keyboard controller with a decent range and excellent configurability, you should check out SubZero's offering. Bus powered via USB, musical response from drum pads, sturdy rotary dials. Keyboard action is a little unnatural, faders and upper panel feel a touch flimsy, backlit display not clear from all angles. Most tasks carried out in modern music production have been assimilated into software. As a result, the vast majority of studios are no longer filled with the kind of hardware you would have seen in them 10 years ago. A MIDI controller keyboard, however, is as essential now as it was decade ago for most music makers. Not just for note input either, but also for drum part creation via pads, mixing control via sliders and even transport control, to enable navigation through projects. 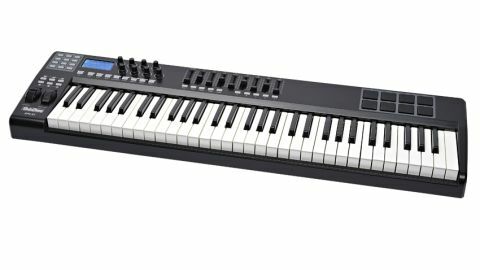 The SubZero SPC61 is, as its name suggests, a 61-key, five-octave controller keyboard that features many of these controls, despite a compact front-to-back footprint. The upper panel includes eight rotary knobs that transmit MIDI control messages, which in turn can be assigned to synthesizer and plug-in parameters within your workstation software. Alongside these are nine faders, the left one of which is marked 'volume'. Like the rotaries, the rest of these can be assigned to functions of your choice. On the far right-hand side, eight drum pads are there for you to tap out rhythms when programming rhythmic material. Over on the far left-hand side, six transport controls provide 'record', 'stop', 'play', 'rewind', fast-forward' and 'return to zero' commands, encouraging you to drive a session directly from the controller rather than your computer keyboard. Below these are pitch bend and modulation wheels, the latter of which can be used to introduce performance characteristics such as vibrato to parts recorded in real time. A number pad in the upper left-hand corner completes the control set. Setup is straightforward as the SPC61 is bus powered, meaning you can use the provided USB cable not just for communication between the controller and your computer, but also as its power source. This is particularly useful if you're intending to use the keyboard onstage. Less usefully, the manual comes on a mini CD, meaning you'll struggle to use its contents on a laptop. We can't understand Gear4Music's decision here. Once you're up and running, integration into DAW software is immediate. The SPC61's action is a touch firm as you press a note and a little springy upon release, but it is nevertheless playable. The rotary dials feel reassuringly firm, though pressing buttons hard does reveal the slightly plastic nature of the keyboard's frame. Most importantly, the SPC61 is fully configurable. This means that rather than having to stick to the default MIDI controller assignments, you can change them for sliders and dials so they match the parameters you wish to control. Plus, any configurations you create this way can be saved for recall on subsequent projects. The backlit screen which enables you to see these assignments isn't as clear as it might be - you need to look at the screen directly rather than from an angle to see it clearly. Otherwise, this is a fairly comprehensive controller at a competitive price.